As you know, our body needs calcium to build and repair bones, and at the same time calcium needs vitamin D for it to be effectively absorbed by the body. We know that vitamin D is produced when our skin absorbs sunlight. Today, however, we fear that sunlight might cause skin cancer and other complicated diseases due to strong ultraviolet ray and unknown light beam created by optical pollutants. Yes, some foods contain lots of vitamin D and other supplements are available for that purpose. Our studies show that young men active in sports who took higher doses of calcium and vitamin D supplements for about two months had fewer "stress fractures". Although we do not know more details of its clinical data, yet, at least it is somewhat an encouraging outcome. Of course, we need more studies to know its real benefits to us. 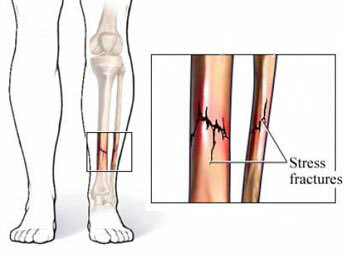 Stress fractures usually occur among young students during their heavy sports activities. Of course, we are trying to find the simplest prevention techniques. The body uses calcium to build and repair bones. Vitamin D helps the body absorb calcium. Usually, doctors recommend about 1,000 milligrams of calcium and 200 IUs of vitamin D each day for adults of at least above 16 years old. According to data received from athletes who took nearly 2,000 milligrams of calcium and 700 IUs of vitamin D every day had much less stress fractures. On the side note, we notice that people who expose their body to sunlight have better physical built than those wearing clothes. Try to get vitamin D from the sunlight. It's free. Of course, athletes who practice in fields have a higher risk of stress fractures. We really recommend taking calcium and vitamin D from foods in their diets, sunlight, and supplements to avoid injuries.